Walter Foster Publishing, 9781633220485, 128pp. Learn how to transform washi tape and paper into beautiful stationery, giftwrap, home decor, gifts, and more--all with just a few simple tools! Paper & Tape: Craft & Create is full of unique and inspirational ideas and step-by-step projects that are perfect for washi tape crafters of any skill level. From birthday cards and DIY coasters to paper puppets and wall art, this engaging book is packed with helpful tips and beautiful photographs of finished work. Inside you'll discover how to "draw" and "write" with washi tape, make your own cards and envelopes, build pretty washi tape collages, and more. This book also features "Mini Make" projects that show you how to turn five common craft materials into innovative projects using washi tape. 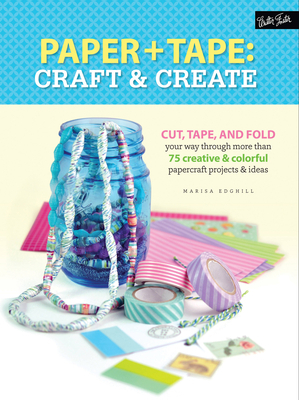 Full of inspirational instruction, sophisticated artwork, and myriad ideas to explore and build on, Paper & Tape: Craft & Create is sure to spur endless DIY and craft projects and spark hours of washi tape fun!